Many people with low vision due to macular degeneration or other retinal conditions often find that as their eye condition worsens that their eyeglasses are no longer performing as well as they used to. Even with a new eyeglass prescription, words look blurred and faces appear fuzzy. The dark or blank spot in the center of their vision interferes with their ability to see. Enjoying a baseball game in the stands or a favorite musical at a theater is not as enjoyable as it used to be. Seeing far and seeing near becomes a challenge. This is when many people wonder if there are any special low vision or macular degeneration glasses that can help them – more than than just regular eyeglasses. The answer is yes. According to low vision specialist Dr. Randy Kinkade, OD, MPH, FAAO, “A standard eyeglass lens is only capable of focusing light onto the damage light sensitive cells (photo-receptors) in the macula. 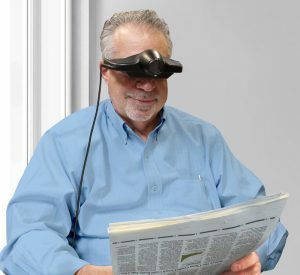 The picture is blurred because the macula is now flawed.” However with the use of two special lenses rather than the standard single eyeglass lens, patients experience better magnification and smaller blind spots. so are there different eyeglasses that each serve a different purpose. 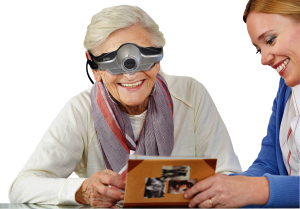 So while there is no one pair of eyeglasses that can take care of all one’s visual needs there are several low vision magnifying glasses that can enhance one’s usable vision. This type of low vision eyeglasses provides high-powered magnification which reduces the size of one’s blind spots. They are beneficial for computer use, reading, writing, playing cards, reading music, and performing crafts and hobbies. Special lenses provide magnification while special tints and coatings help to improve light transmission, reduce glare and improve contrast. Special binoculars or telescopes are mounted onto glasses and are useful for watching television, enjoying the theater, taking in a baseball game, appreciating scenery or wandering through a museum. These special low vision glasses are not available from most regular eye doctor’s offices. The patient needs to be seen by a low vision optometrist who is trained in low vision optics to be evaluated and tested to determine which glasses are the most helpful. Patients have the opportunity to try the glasses to be sure their vision is improved before purchasing them. Jordy is a pair of visually impaired glasses that offer a wide rage of magnification.